If you are a patient who has received a disheartening diagnosis from your local doctor, know that there ARE options out there for you. 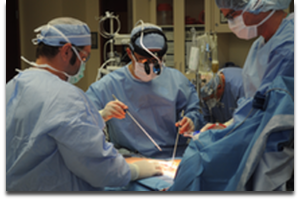 Dr. Ciuffo offers minimally invasive heart surgery procedures have been highly successful in treating high-risk patients for many years. It’s your heart and your life! The advanced technology has evolved our minimally invasive heart surgery methods which have allowed for a low-impact and soft-touch high-risk heart surgery treatment. Surprisingly, even the most elderly and frail of patients can enjoy a quick and comfortable recovery regardless of their overall physical health. If you have been given a diagnosis as inoperable, we HIGHLY recommend that you come in to get a second opinion. Dr. Ciuffo uses the most cutting edge technology to perform successful, minimally invasive heart surgery procedures for high-risk heart surgery patients. Read Gwen’s success story, the 70-year old “inoperable” patient who received a successful aortic valve replacement. She recovered quickly and was able to enjoy many more years living life to the fullest with her family. Dr. Ciuffo’s minimally invasive procedures can be a viable option for patients who have previously been told their heart condition is inoperable or a high-risk heart surgery procedure. These procedures are performed through a small, two-inch incision between the ribs, which eliminates the need for breaking bones. Without broken bones and a large surgical incision, high-risk heart surgery patients are able to recover quickly and comfortably. Read patient testimonials to get a better idea of Dr. Ciuffo’s surgical expertise and how it works. Schedule a consultation with Dr. Ciuffo online or by calling our office at (330) 363-1341. We are happy to discuss your diagnosis and create a personalized surgical plan to extend and enrich your life.